A COMMUNITY leader has taken his battle to save a much-loved Oxford subway all the way to 10 Downing Street. Oxfordshire County Council is set to fill in the popular Headington subway as part of the second phase of a £3m scheme to tackle traffic congestion in London Road. The improvements mean the 1970s subway will be closed at a cost of £45,000 and replaced with a pedestrian crossing. 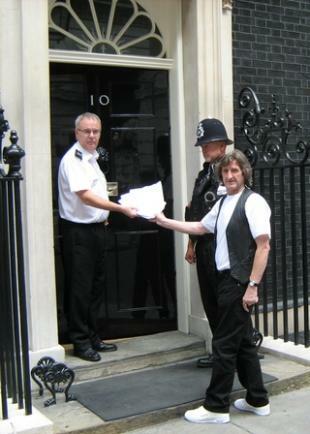 Yesterday, Mick Haines took a 2,411-signature petition to Number 10 to try to save the Kennett Road underpass. Work to fill it in will not start until next year at the earliest. Mr Haines, 68, of Croft Road said: “The fight will go on to save the subway and I hope this has some impact. “The people of Headington want to keep it because it’s an asset from a safety point of view. “Also it is a part of Headington’s history and if they take it away they are taking part of Headington away. A survey by Headington city councillor David Rundle revealed 61 per cent of residents were in favour of keeping the subway and he says it should be kept alongside a new crossing. But the county council said its survey showed that 58 per cent of Headington residents were in favour of scrapping it when they realised there would be a replacement crossing. County engineer Colin Baird said at a meeting earlier this month that the current subway would not be permitted under modern building standards as the ramps are too steep for people with mobility problems. He said it would be impossible to accommodate both crossings without an expensive rejig of the first phase of the scheme. There have been 40 road accidents involving pedestrians crossing London Road over the last five years. OXFORDSHIRE County Council is making almost £200,000 a year renting out schools and fire stations as locations for mobile phone masts. Figures obtained by the Oxford Mail reveal phone companies have installed equipment across the county to extend their coverage. Oxford City Council also makes £42,750 a year renting out space on four of the city’s five tower blocks – Windrush, Plowman, Hockmore and Foresters. Last night, a campaigner against phone masts urged the council to rethink its policy. Mick Haines, of Croft Road, Marston, Oxford, said the dangers of placing phone masts near schools had never been disproved. Kidlington Fire Station is home to Vodaphone, T-Mobile and O2 masts and earns the council £19,680. Matthew Arnold School in Arnolds Way, Oxford, is leased to Orange, O2 and T-Mobile and brings in £17,500. Overall, the county council makes £193,500 a year. Mr Haines has protested against masts for the past decade and collected more than 3,000 signatures on three different petitions. He said: “I don’t like the sound of these figures – phone masts should be nowhere near residential areas. “The dangers of phone masts have never been proved but, more importantly, they have never been disproved. We just don’t know. O2 spokesman Jim Stevenson said there was “no evidence” that phone masts were harmful. He said: “In the past year we have undertaken a massive amount of scientific research in all areas relating to this, and in every case it has produced a firm reassurance that there is no risk from phone masts of mobile phones. “There is no harm at all in relation to people’s health and safety, or indeed that of their children.